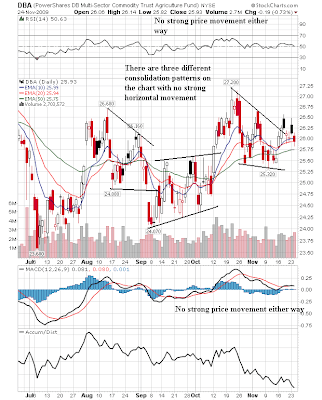 Weekly Indicators: "National Beached Whale Day" special edition! Yesterday the turkeys were stuffed. Today, it's 300 million stuffed Americans who are imitating beached whales, so keep your belt unbuckled and check out how the high-frequency economic indicators fared last week. Monthly indicators were mixed. The BEA revised 3rd Quarter GDP down to 2.8%, as expected, due primarily to an increase in imports. On the brighter side, Personal Consumption Expenditures - a measure which generally leads the business cycle - improved, as did personal income and real disposable income. The Case-Schiller house price index continued to show monthly improvement, and better Year over Year comparisons, although still down on that basis. New Home Sales for October also showed improvement. New orders for nondefense capital goods - a Leading Indicator - improved. Consumer confidence improved from earlier this month, but still declined compared with the last several months. 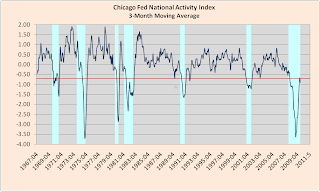 The Chicago Fed’s National Activity Index (CFNAI) stalled, declining slightly for the first time this year. Durable goods declined substantially, a complete surprise compared with expectations. The American Trucking Association also reported a small decline in October traffic, the second in a row. My co-blogger Silver Oz points out that some of the improvement in rail traffic might have to do with substitution effects due to the price of oil. The BLS reported initial jobless claims, seasonally adjusted, were 466,000. On an unadjusted basis they were totaled 543,926. By contrast, last year there were 609,138 initial claims. ICSC Research now expects same-store sales for November to increase 4 percent to 6 percent as easy year over year comparisons will dominate the results. reported that year-over-year GAFO retail sales increased 0.9 percent for the week ending November 21 while sales rose a slight 0.2 percent versus the previous week ending November 14. Rail traffic continued to point to bullishness, as intermodal traffic remained stable, while baseline, cyclical, and total traffic went UP! It is particularly bullish that cyclical traffic went up this late in November. (Last week a commenter asked why I use this site vs. the AAR site. The short answer is that I am looking for high-frequency weekly data to see if the economic expansion is stalling or not, and the AAR's report is monthly. The two reports on a monthly basis appear to give virtually identical numbers). The Daily Treasury Statement for November 24 showed $103.1 million paid withholding taxes so far this month compared with $111.3 on November 24 last year. This is still the best Year-over-Year comparison since March, and while it continues to show great stress in the jobs market as well as for state and local municipalities, it may be bottoming on an absolute basis now. The Department of Energy's weekly report showed that demand for gasoline, after spending several weeks lower than one year ago, improved last week slightly compared with last year. Refinery stocks are running above average as they have all year. The Price of Oil fell under $74 on the Dubai investment scare. Given that result, a couple of more middle eastern petrosheikhdoms getting into financial trouble might be kinda nice! We're signing off for the rest of the week. Have a good Thanksgiving. This is Bonddad. I mention that because there are four writers here: me, New Deal Democrat, Invictus and Silver Oz. I (as in Bonddad) still believe the economy will grow in the 1%-2% range for the next few quarters. I have been saying that for the previous 6 months. Until I see otherwise, I will continue to hold to that prediction. In case you are wondering, there are several reasons for this. 1.) We are use to major quarter to quarter percent changes in PCEs. However, these do not need to grow at a fast pace to add to growth. If we see 1% PCE growth per quarter that will be sufficient for now. 2.) We still have a lot of stimulus money left to spend. 3.) We have a lot of inventories to rebuild. 4.) Exports are increasing. Yes, they are increasing at a slower rate than imports. But the point behind the increase in exports is it shows our trading partners are also growing. And contrary to the great myth of the econo-blogsphere, the US still manufactures a lot of stuff. We just do it with fewer people. 5.) The Fed is keeping rates very low. I have yet to see any data which seriously undermines the above points. Now, there are other writers who post here. I asked them to post here because they provide a solid counter-balance to my viewpoint. And unlike the vast majority of doom and gloomers, Silver Oz and Invictus provide thoughtful, well-researched and well-presented presented commentary. They both know the difference between the household and establishment job survey. And they're analysis does not jump around from point to point in an attempt to desperately hold onto a perspective. Instead, they rely on a dispassionate reading of data. For those of you who are apparently having trouble with reading comprehension, everyone signs off on their work at the bottom of the page. So, before you assign a particular writer's viewpoint to me (or mine to somebody else), please look at the bottom of the page before doing so. It's really not that difficult. In addition to the very good (relatively speaking of course) Initial Jobless Claims report this morning (see below), there were 4 other economic releases pushed up to today due to the Thanksgiving holiday. Two were good, two not so good. 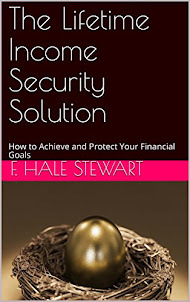 Personal income increased $30.1 billion, or 0.2 percent, and disposable personal income (DPI)increased $45.7 billion, or 0.4 percent, in October, according to the Bureau of Economic Analysis. Personal consumption expenditures (PCE) increased $68.3 billion, or 0.7 percent. In September, personal income increased $20.7 billion, or 0.2 percent, DPI increased $21.3 billion, or 0.2 percent, and PCE decreased $60.3 billion, or 0.6 percent, based on revised estimates. Real disposable income increased 0.2 percent in October, compared with an increase of 0.1 percent in September. Real PCE increased 0.4 percent, in contrast to a decrease of 0.7 percent. Shorter good news: consumers have more to spend, and they are spending it. This is necessary for job creation. Additionally, New Home Sales rose 6.2 percent to an annual pace of 430,000, the highest level since September 2008, the Commerce Department said today in Washington. The median sales price fell 0.5 percent and the number of unsold homes reached a four-decade low. On the other hand, the University of Michigan "index of consumer expectations fell 2.1 points to 66.5. This is an upward revision from the 63.7 reported in early November, which economists were expecting would be revised to 64.0." This is a leading economic indicator, and while better than most of this year, is still worse than September or October, so this will be a negative. increased $0.6 billion or 1.2 percent to $54.6 billion. There is some evidence (see, e.g., Invictus' post about the CMI, as well as the American Trucking Association's Index) that manufacturing may have stalled in October. We'll find out a lot more on Monday with the ISM report. Despite that, the majority of the reports are good. P.S. While you are doing your annual post-Thanksgiving imitation of a beached whale on Friday, belly up to the computer, because I will be posting the regular "Weekly Indicators" then as usual. A.) In September and October, prices rose in a gentler manner. They'd hit a high and the round out the action. This allowed the market to absorb the gains. B.) So far this month, gold is simply screaming higher. E.) The A/D line is telling us people are still moving into the market. Also note the EMA situation: the shorter EMAs are above the longer EMAs, all the EMAs are moving higher and prices are above all the EMAs. Initial Jobless Claims: 466,000 ! The BLS reported that for the week ending Nov. 21, seasonally adjusted initial jobless claims were 466,000. Last week's number was revised to 501,000. This is the best showing since "Black September" 2008 when the economy nearly ground to a panicked halt. The 4-week moving average was 496,500, a decrease of 16,500 from the previous week's revised average of 513,000. 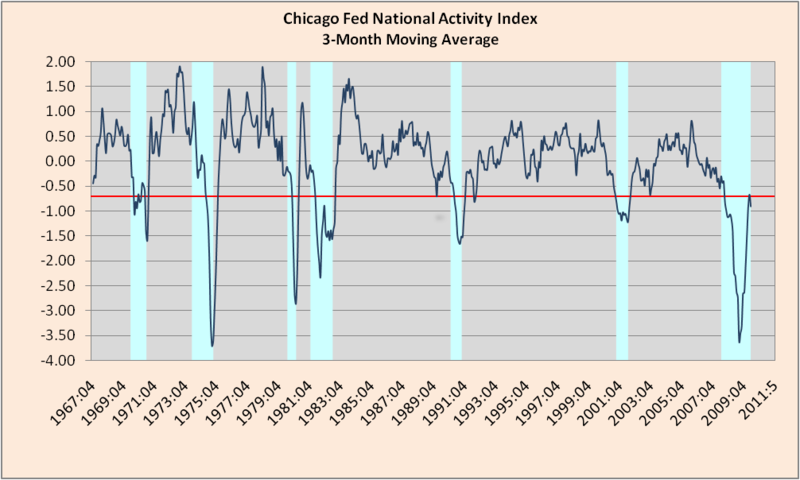 The 4 week seasonally adjusted moving average is now about 24% lower than the peak of 658,750 on April 3 of this year. Unadjusted, there were 543,926 new claims, an increase of 68,080 from the week before, and well below the 609,138 initial claims in the same week last year. In unadjusted terms, this was the best new claims number, relative to normal seasonal adjustment, in well over a year. Because the BLS normally surveys business payrolls in the week ending the 12th of the month, this decrease if it persists won't show up until the December jobs number. If it does, according to my previous research, this indicates that jobs are actually being added to the economy. In this position I am at odds with people like Berkeley Economics Professor Brad DeLong and Calculated Risk, who say that the claims number must drop ot 400,000 before jobs are added. A number like today's is why I said I have no problem being proven wrong, provided that it is done quickly! At the time of the 501,250 4 week average of new jobless claims reading in 1990, payrolls lost 160,000 that month and 211,000 the next. In 2001, the new jobless claims high of 489,250 coincided with payroll losses of 325,000 that month and 292,000 the next. This year, we have already seen in August new jobless claims in the 560,000-570,000 range coinciding with a payroll loss of 151,000. Sorry for being late with this. This week has been very crazy with with are traveling. I want to return to the strong A/D line as it indicates that even when the market was in a correction in October there was not a flight out of the Treasury market. That is very important considering the equity markets rallied for the first part of October. This tells us there is still an undercurrent of concern in the markets regarding the rally. I think part of this is end of the year, lock in your profits thinking. However, the equity rally is getting thinner -- meaning we're seeing the rally gravitate to the big cap stocks. This is a safety play. The main issue with the agricultural prices chart is there is no clear direction either way. 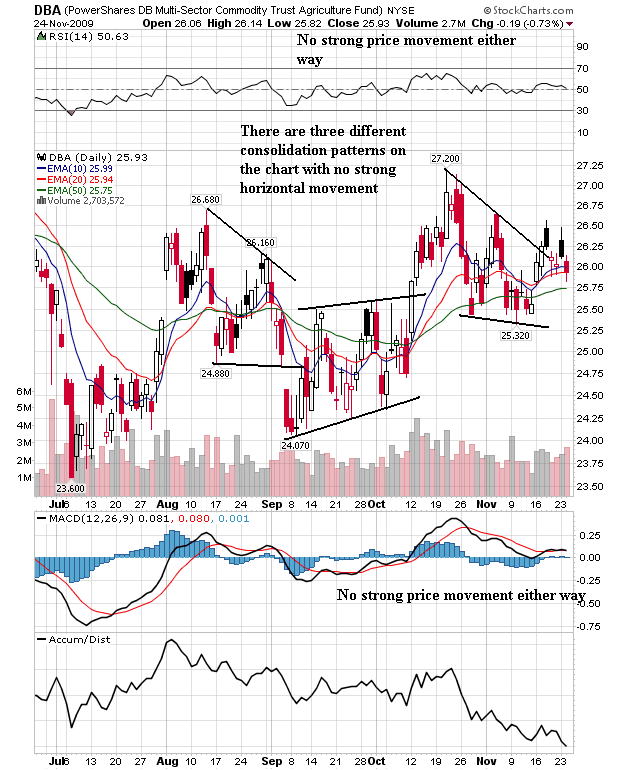 There are three different consolidation patterns with no strong up or down move between them. 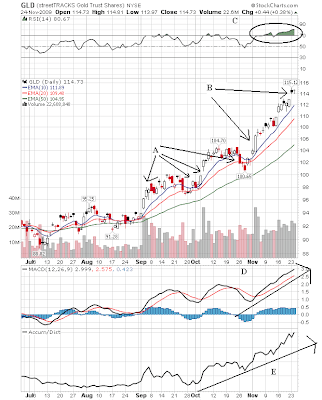 The MACD and RSI confirm there is no momentum in either direction. The EMAs are all moving higher, but they are in a very tight pattern. Prices are simply bouncing from one consolidation pattern to the other. The only key takeaway from this chart is the accumulation/distribution line which shows that volume is leaving this market. "While these developments were positive, participants noted that it was not clear how much of the recent firming in final demand reflected the effects of temporary fiscal programs to support the auto and housing sectors, and some participants expressed concerns about the ability of the economy to generate a self-sustaining recovery without government support." This, to me, encapsulates exactly where we are right now -- still on life support without a clue as to how the patient might fare if it were withdrawn. "The weakness in labor market conditions remained an important concern to meeting participants, with unemployment expected to remain elevated for some time. Although the pace of job losses was moderating, the unusually large fraction of those who were working part time for economic reasons and the unusually low level of the average workweek pointed to only a gradual decline in the unemployment rate as the economic recovery proceeded. In addition, business contacts reported that they would be cautious in their hiring and would continue to aggressively seek cost savings in the absence of revenue growth. Indeed, participants expected that businesses would be able to meet any increases in demand in the near term by raising their employees’ hours and boosting productivity, thus delaying the need to add to their payrolls; this view was supported by aggregate data indicating rapid productivity growth in recent quarters." In all, I think the FOMC minutes were another "things are less bad" report, but there are still very real concerns about the fragility of whatever recovery we may experience and the ease with which it might jump the tracks. I'm still traveling. Posting will be sporadic today and tomorrow. I think all of us will be taking Thursday and Friday off. Bureau of Economic Analysis. In the second quarter, real GDP decreased 0.7 percent. The GDP estimate released today is based on more complete source data than were available for the "advance" estimate issued last month. In the advance estimate, the increase in real GDP was 3.5 percent (see "Revisions" on page 3). 1.) Durable expenditures increased 20.1%. This is obviously the result of cash for clunkers. However, non-durable expenditures increased 1.7% and service expenditures increased 1%. In other words, we saw good increases in all the components of PCEs. 2.) Auto related activity added 1.45 to overall growth. This will of course be a lightening rod where people will argue this wasn't real growth because of the C4C program. To that I would respond with the following: at the end of every recession we typically see government incentives to increase activity. If memory serves, at the end of the last recession we saw an increase in the depreciation deduction as a way to increase business investment. In addition, government spending typically accounts for about 20% of overall economic growth. If you're going to jump on the C4C number, fine. But please revise all economic numbers to take out all government programs at all times simply to be consistent. Finally, I've noticed trend where people who argued for the stimulus are now arguing against the latest GDP number. So -- make up your mind please. 3.) Residential investment increased 19.5%. That's a good sign. However, remember the housing starts decreased last month at a 10% clip. 4.) Exports increased 17% and imports increased 20%. While this is an overall negative for the report (this combination subtracts from growth) it does indicate that we are growing. So -- I'm still pleased. Notice the rate of decline continues to decrease. In other words, we're moving in the right direction. About half of the large cities showed improvement. Also note the rate of decline in those cities that showed a decline was low. Conference Board data show no significant improvement in consumer confidence during November. The headline index rose slightly to 49.5, still disappointing compared to August's 54.5 level that raised expectations at the time of significant second-half improvement. A key to those expectations was a rise in the expectations index toward 80, a level that right now seems out of reach with the index currently at 68.5. The present situation index remains near record lows, down 1 tenth to 21.0. The present assessment of the jobs market eroded slightly, with slightly more saying jobs are hard to get, now at 49.8 percent, and slightly fewer saying jobs are plentiful, at 3.2 percent. Inflation expectations are benign, unchanged for a third straight month. Today's report points to no improvement in the labor market and will not boost expectations for holiday retail sales. Confidence has been moving sideways since April. This is largely the result of the jobs market. When unemployment continues to increase consumer's aren't going to be happy. The good news in this number is it hasn't crashed. The had news is it hasn't gone higher. Considering the unemployment rate this is probably about as good as we can expect. So, the economy is still growing, the housing market is still improving but consumer's are still sanguine. Though not necessarily cause for concern, the decline is certainly worth keeping an eye on. As one data point does not a trend make, I'll simply suggest this could be a yellow flag. 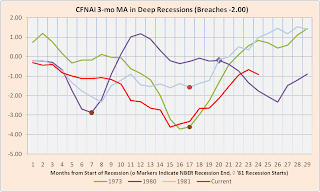 Below I have charted the 3-month moving average of CFNAI for the four recessions in which it breached –2.00 (in other words, nasty recessions). The circular markers represent the points at which the NBER determined the recessions ended. The diamond marker is where the ‘79 - ‘80 recession bleeds into the ‘81 recession (the purple line from the point of that diamond coincides exactly with the light blue line at month one. Got it?). 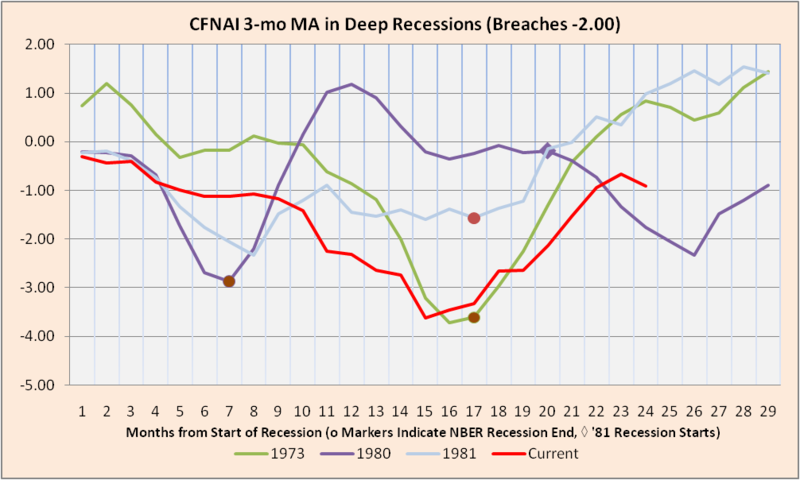 Given the fact that some NBER metrics are still in decline (employment, real income), and that another (real retail sales) is arguably flat-lining, I’m not sure we’ll be seeing an end-of-recession call any time soon, and today’s downturn in the 3-month MA of CFNAI bears close watching in the months ahead. This is Bonddad -- I'm traveling early tomorrow AM and am hopelessly behind on packing right now. I'll post some market stuff when I get to Cincinnati where my wife and I are spending Thanksgiving. Geithner's tenure has been rocky with lawmakers and the public, and recently he has appeared to have fallen out of favor again. Geithner has come under criticism for the Obama administration's regulatory overhaul, which he had a key role in developing, as well as the bailout of American International Group (AIG Quote) and its trading partners, like Goldman Sachs(GS Quote), during his position as New York Federal Reserve chief in the previous administration. Last week, he got into a heated exchange with members of the Joint Economic Committee over the handling of the economic crisis, with Republican Rep. Kevin Brady of Texas asking whether he'd resign and saying "the public has lost all confidence in your ability to do your job." It's unclear whether that will happen, but JPMorgan's Dimon may be at the frontline of possible successors, according to the New York Post. Dimon has had what appears to be a friendly relationship with regulators. He has also been quite vocal in his views about regulatory proposals, even if they don't necessarily benefit the industry or JPMorgan. For instance, while he has been critical of plans for a consumer protection agency, he recently wrote an op-ed in the Washington Post outlining his opposition to the notion of "too big to fail," despite the fact that his bank is considered just that. I haven't written much about the Obama economic team. I don't think they're bad, but I also don't think they're great. But, I have to wonder how good anybody is when they're handed the worst financial situation in the last 60 years. While arm chair quarterbacks will of course point out all the mistakes they perceive, these are the same people who don't know the difference between the household and the establishment job survey. In other words, take the criticism with the largest grain of salt possible. In addition, we're at a point where impatience is trumping reality. Considering the damage that the economy was in a year ago -- when there was a very real threat of a deflationary spiral like that the started the Great Depression -- we're actually doing OK. We saw growth last quarter (as have a number of countries), the manufacturing sector has rebounded, housing is bottoming, consumer spending is flat, and exports and imports are rising. The main issue is the unemployment rate which is a lagging indicator and for which there is unfortunately no silver bullet. My political guess (for what it's worth) is someone will probably get fired largely to assuage anger and frustration. Who it is doesn't matter. Regional and state unemployment rates were generally little changed or higher in October. Twenty-nine states and the District of Columbia recorded over-the-month unemployment rate increases, 13 states registered rate decreases, and 8 states had no rate change, the U.S. Bureau of Labor Statistics reported today. Over the year, jobless rates increased in all 50 states and the District of Columbia. The national unemployment rate rose to 10.2 percent in October, up 0.4 percentage point from September and 3.6 points from October 2008. In October, nonfarm payroll employment increased in 28 states and the District of Columbia, decreased in 21 states, and remained unchanged in 1 state. The largest over-the-month increase in employment occurred in Texas (+41,700), followed by Michigan (+38,600), California (+25,700), North Carolina (+12,100), and Pennsylvania (+10,600). Michigan experienced the largest over-the-month percentage increase in employment (+1.0 percent), followed by the District of Columbia (+0.8 percent), Montana (+0.7 percent), Oklahoma (+0.6 percent), and Utah (+0.5 percent). The largest over-the-month decrease in employment occurred in New York (-15,300), followed by Florida (-8,500), Georgia (-7,500), Virginia (-7,100), and South Carolina (-5,800). Wyoming (-0.9 percent) experienced the largest over-the-month percentage decrease in employment, followed by Idaho and Nevada (-0.4 percent each), and South Carolina (-0.3 percent). Over the year, nonfarm employment decreased in all 50 states and increased in the District of Columbia. The largest over-the-year percentage decreases occurred in Arizona (-6.9 percent), Michigan (-6.4 percent), Nevada (-6.0 percent), Georgia (-5.6 percent), and Wyoming (-5.5 percent). First, remember there are two employment surveys -- the establishment and the household; hence the divergence of results. The unemployment numbers shouldn't surprise anyone. In last months employment report we saw an increase in the unemployment rate from 9.8% to 10.2%. However, the fact that a majority of states saw job growth is encouraging. Better yet, two states (California and Michigan) saw growth. These are states that have been hit hard by real estate (California) and the auto sector issues (Michigan). Bottom line: the second part of the report is encouraging. Figures released Monday by the Organization for Economic Cooperation and Development showed economic output in its 30 members during the three months to September was 0.8% higher than in the second quarter, although it was 3.3% lower in annual terms. The OECD said the combined GDP of the Group of Seven largest developed economies rose 0.7% from the second quarter, but was also down 3.3% from a year earlier. The P&F chart really shows how large cap stocks have done. Above is a P&F chart of the OEF -- the ETF that tracks the S&P 100, or the biggest stocks in the S&P. Notice that there is a ton of volume on the up moves. Also note there is only one small down move of any significance over the last 7-8 months. This tells us the big cap stocks are the big movers of this market. A.) The QQQQs broke a long-term uptrend at the end of September. B.) 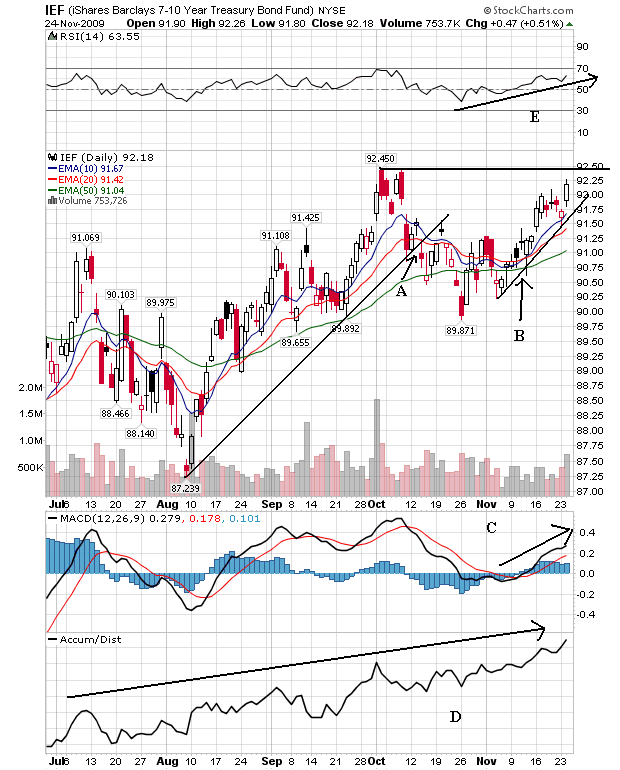 Now prices are forming a broadening top pattern, indicating we may be reversing. B.) Prices have tried to move through the 72-73 area three times without any success. Also notice we have a descending bottom. 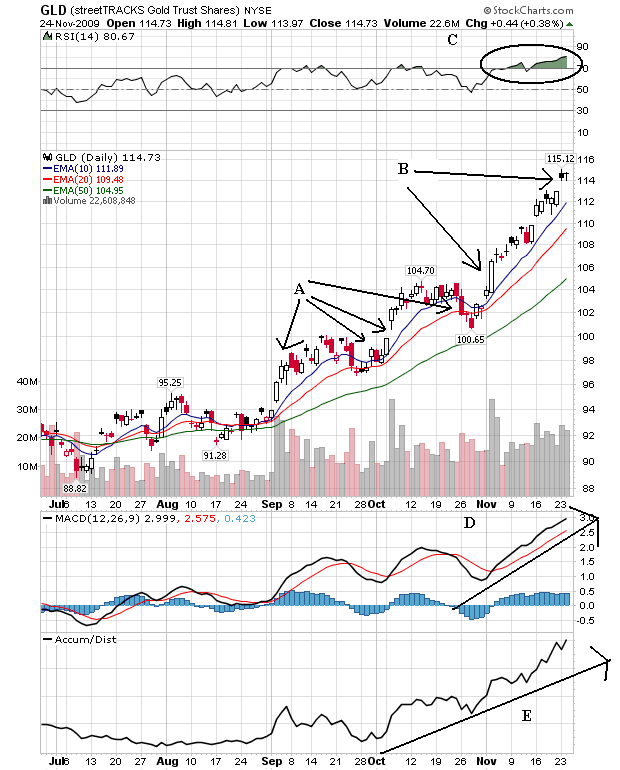 Most importantly, as prices on the larger stocks have made new highs, the Transports have not confirmed. C.) Formed an upward sloping channel. So, we have a ton of money still going into the large cap stocks. 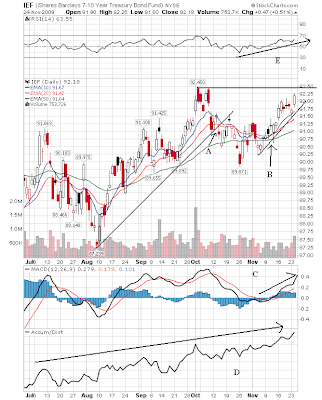 However, the transports and micro-caps are not following suit. That tells us the rally is getting narrower which is not healthy. Signs of wariness are appearing in financial markets as investors worry that the end of the year could bring challenging trading conditions. Last week saw a steep drop off in stock-market trading volume and a surge in demand for short-term government debt, indications that investors and financial institutions are growing cautious and retreating from riskier bets. That defensive behavior is relatively common toward the end of the year. But this year it's happening earlier than usual. An uncommon confluence of events is driving the shift. The biggest catalyst is a reluctance among investors to take on new aggressive bets and avoid a late-year blow-up in their portfolios. Many are sitting on big gains after a 58% surge in the Dow Jones Industrial Average since early March and record returns from some corporate bonds. "People who have booked some significant gains…are looking to take risk levels down," says Brian Fagen, co-head of Americas liquid market sales at Barclays Capital.